When navigating through the site, I noticed that it contained a lot of PDF files that shouldn’t be there and the diversity of files is enormous. Almost each file on the site is uploaded by a different user. The users seem to be fake. The site is very simple. You can search and view a file, you can register yourself and upload a file. That’s it. Nothing more, nothing less. You can build such a site in a week. I tried uploading Word, PDF and PowerPoint files in different browsers but couldn’t upload them. The interface and functionality is very basic and partially broken. I get the impression that the owner doesn’t want users to actually use it. It just contains an upload button after you log in, and then you’ll get intentionally demotivated by a malfunctioning upload button. I was wondering how many documents were stored on the site, so I asked Google. It seemed that Google indexed 375.000 web pages. That’s quite a lot! From looking through these documents it was clear that this site was copying (scraping) these documents from other sites. I even found my own hacking guide that I wrote in 2004 when I was in high school! It has been viewed 290 times in the past 2 years. So that’s 290 visitors that haven’t visited my weblog. This is now getting personal. If you host a search engine optimized site with 375.000 PDF files, then you’ll attract a lot of visitors. The average click-through-rate for advertisements on the Google Adwords display network is 0,35%. That means that 3.5 clicks will be generated per 1,000 visitors per advertisement. 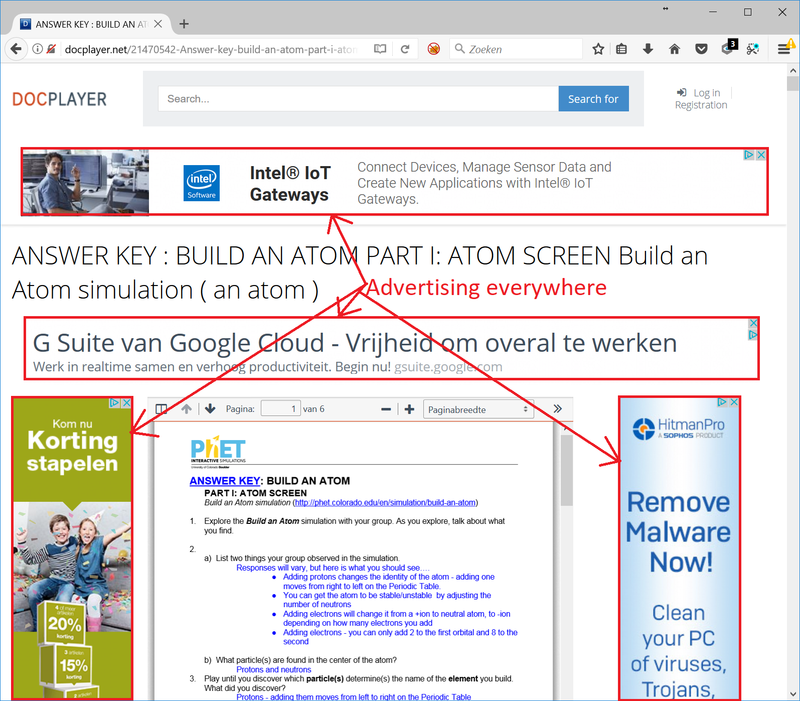 With 4 advertisements placed on docplayer.nl, it might drive up the click-through percentage towards 1%. The average price-per-click for advertisers on the Adwords network is between $0.5 and $1. This revenue is split between Google and the website owner that hosted the advertisement. According to Alexa the site is ranked as the 209,334 most visited site in the world, and the 3,945 most popular site in The Netherlands. Not bad! 59% of the visitors seem to be Dutch and 24% Belgium. This is logical because the site contains mostly Dutch content. Unfortunately Alexa doesn’t have intelligence on the amount of visitors for this site. Another site that estimates traffic data is Informer.com. They estimate that docplayer.nl receives 160,230 unique visitors a month, while ChkWorth.com states they receive 264,753 and SimilarWeb.com states 416,640 visitors a month. It will probably be something in between these numbers. The estimated advertisement revenue is $988 according to ChkWorth.com. Not a lot. So who’s behind the site? According to the terms of service the website owner is DocPlayer Inc. and based in Virginia. I started googling but couldn’t find a company called DocPlayer Inc. and no one is talking about this company, like it doesn’t exist. If your register a domain name, then you have to supply information about who your are and where you live. This information will then be submitted to an open domain name ownership registration database which can be queried. Registration information of docplayer.nl revealed that someone called Vladimir Nesterenko living in Moscow is owner. Doesn’t sound like an American company to me! That are quite a lot of domain names! 54 to be precise, in 19 different countries. This enterprise is way bigger than I initially thought! I started visiting each site and eventually understood that there were two platforms here. One for displaying PDF files called DocPlayer, and one that displays PowerPoint presentations called SlidePlayer. 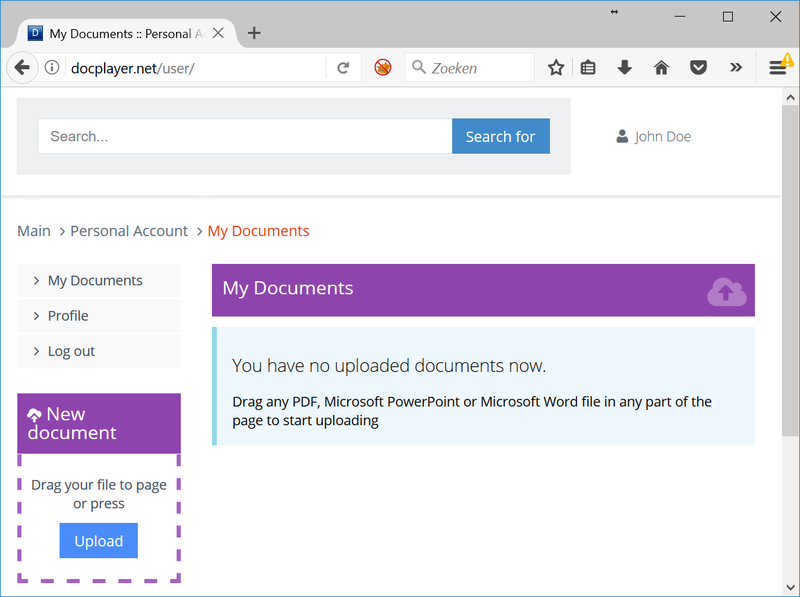 Each platform spiders websites in a specific country and looks for PDF and PowerPoint files, copies them, and orders all the files based on the language they’re written in. All the Dutch files will be broadcasted via docplayer.nl, all France content via docplayer.fr, etc. This strategy is excellent for getting these sites to score high in search engines: it’s localized per country, contains a lot of content in the same language and no content is duplicated across these sites. I checked if I could fill in the missing IDs in above list by performing a reverse look-up on other sites belonging to Google Analytics account UA-34773609, but unfortunately I couldn’t find anything useful. Oh, so you want to download a presentation? Hold on! If you’ve made it through the whole process, you’re rewarded with a downloadable PowerPoint file. Now that’s a hell of a customer journey! Of course these hurdles are there to make you go away. They purposefully create a bad customer experience so you don’t pay attention to the site. From the website perspective, the ideal visitor comes from Google and lands on a webpage that hosts a PDF or PowerPoint file. Hopefully the visitor clicks on an advertisement surrounding it and leaves the site. The worst case scenario is that the visitor stays on the site and creates an account and starts using the platform. This will generate attention to the site. Visitors might become aware with what’s going on, and that’s the last thing the owner wants. His platform is full of PDF files that are copied from other sites and re-hosted. This is illegal and if someone creates fuzz about this, it could be the end of his business. Doc- and SlidePlayer have a complaint form attached to each document. If the spider copied documents from other sites that shouldn’t be on the internet in the first place, the owner of those documents won’t be happy if these documents are re-hosted on the internet by Doc-/SlidePlayer, made searchable by Google and archived by the Internet Archive. RTL News found out that the staff behind Doc- and SlidePlayer respond quickly to requests to take down sensitive content from the sites. They seem to have absolutely no interest in hosting sensitive files, as this draws negative attention to them that could blow the whole cover of their operation. And that just happened, because RTL News got a complaint from someone that sensitive tax files were hosted on the site, they decided to ask me to join the team to get to the bottom of this. So how many visitors a month and thus how much money are these two platforms generating exactly? Statistics about the Doc-/SlidePlayer empire. Click on the image to enlarge it. 45 domain names are in active use in 19 different countries. 42 dedicated servers in Germany run the whole operation. 24,3 million PDF and PowerPoint files are hosted on all sites combined. These sites have at least 12.843 incoming links. 23 to 29 million unique monthly visitors for all the sites combined. Estimated 100 million page views per month. The sites generate a roughly estimated add revenue of $92,210 each month. slideplayer.com is ranked as the 6,047 and myshared.ru is ranked as 11,806 most visited site in the world. 11 other sites are also ranked in the top 100,000 list. Looking at the amount of dedicated servers that support the infrastructure, and the fact that multiple sources all roughly report the same statistics, it’s safe to say that some serious money is being made with this simple but very scalable and effective infrastructure. A correspondent from RTL News paid him a visit in Moscow, but he wasn’t home. People around there confirmed he lived there. I bet our Vladimir got the idea of creating a website that hosts PowerPoint files from visiting SlideBoom.com. But instead of waiting for a long time for users to upload content, Vladimir took the shortcut and just copied all the PowerPoints he could find on the internet. The whois information contained two e-mail addresses [email protected] and [email protected]. I searched for hits on these addresses in known data breaches on haveibeenpwned.com. [email protected] is hit in the Exploit.In and VK data breach, and [email protected] is also hit in the Exploit.In, Onliner Spambot and more interestingly: the Bitcoin Forum and BTC leak. The Bitcoin exchange BTC-E was hacked in 2014 and 568k accounts were exposed. The data included email and IP addresses, wallet balances and hashed passwords. If you earn $92,210 each month by hosting illegally 24.3 million PDF files, that’s a hard story to sell to the tax authorities. Bitcoin is a way stealthier way of storing wealth, and our Vladimir seems to be well aware of that. Google is partners in crime with Vladimir. They bring him all the visitors and split the cut in advertisement revenue. Google also profits when people click on their advertisements. They’ve made millions in the last few years hosting their ads on Doc-/SlidePlayer. RTL News contacted Google spokespersons but they didn’t want to look into this matter and seems to be fine with the current situation. If nobody complains further, they earn half a million dollar a year, so why take these reports serious? Media is not law enforcement. As RTL couldn’t get through, I also tried contacting Google. Their spokesperson doesn’t want to comment on the matter. It seems Google is fine with the situation. Why bother? It’s very profitable! What started with a few tax files that were hosted on docplayer.nl, let to the discovery of an empire that makes a million dollar a year by illegally hosting 24.3 million files copied from other sites. This cover/fake site is an elephant in the room that nobody is aware off. I think it’s wrong what these guys are doing. They’re basically stealing 30 million visitors a month from sites that authored the original content, which results in at least 1 million dollar combined that is stolen per year from all those websites that got copied. 1: Bent u bekend met het bericht ‘Russische whizzkid wordt rijk door jouw documentjes’? 2: Klopt het dat de eigenaar de bestanden op een illegale manier heeft verkregen? 3: Welke acties bent u voornemens te nemen tegen deze website? 4: Bent u bereid om met Google in overleg te gaan om actie te ondernemen tegen deze website? 5: Bent u zich ervan bewust dat in sommige Kamerstukken gelinkt wordt naar de betreffende website? Bent u bereid ervoor te zorgen dat dit in de toekomst niet meer gebeurt? 1: Heeft u het item van RTL nieuws over docplayer.nl gezien? 2: Hoe kan het dat op deze site verschillende belastingaangiftes met burgerservicenummer staan? In hoeverre mag iemand andermans persoonlijke informatie op zijn eigen site zetten? 3: Hoe komt Nederlandse content op een klaarblijkelijk door een Rus beheerde site terecht? 4: Welk gevaar bestaat er dat de beschikbare documenten met burgerservicenummer en namen tot identiteitsfraude leiden? 5: Welke risico’s zijn er dat via deze site snel virussen kunnen worden verspreid? Hoe wenselijk is het dat de overheid deze site ook gebruikt bij het maken van verwijzingen in Kamerstukken (bijvoorbeeld Kamerstuk 34595, nr. 33, p. 5)? 6: Welke mogelijkheden zijn er vanuit de overheid om ongewenste content, zoals ingevulde belastingaangiftes met burgerservicenummer of het personeelsblad van de inlichtingentak van de Militaire Inlichtingen- en Veiligheidsdienst, van de site te halen? 7: Welke mogelijkheden zijn er voor individuen, zo mogelijk gesteund door de overheid, om ongewenste content, zoals ingevulde belastingaangiftes met burgerservicenummer, van de site te halen? 8: Welke verantwoordelijkheid kan hier van Google verwacht worden? Heeft de Nederlandse overheid mogelijkheden om Google tot actie over te laten gaan? Zo nee, waarom niet? Vraag 2: Klopt het dat de eigenaar de bestanden op een illegale manier heeft verkregen? Het betreft een kwalijke zaak dat dergelijke documenten incluis persoonsgegevens online staan. Echter, het valt niet op voorhand te stellen dat deze gegevens illegaal verkregen zijn. Het laat zich aanzien dat deze gegevens, waaronder mogelijk ook persoonsgegevens, bewust of onbewust door gebruikers op het internet zijn geplaatst en daarna door deze site zijn verzameld. Vraag 3: Welke acties bent u voornemens te nemen tegen deze website? Het kabinet hecht aan een vrij en open internet. Daar waar sprake is van schendingen van de Wet bescherming persoonsgegevens (Wbp) is de Autoriteit Persoonsgegevens de onafhankelijke toezichthouder, die de bevoegdheid heeft om op te treden bij schendingen van de Wbp en zelf bepaalt wanneer zij dat doet. Daarbij geldt, op grond van artikel 4 Wbp, dat deze wet slechts van toepassing is op de verwerking van persoonsgegevens in het kader van activiteiten van een vestiging van een verantwoordelijke in Nederland, alsmede in geval van verwerking van persoonsgegevens door of ten behoeve van een verantwoordelijke die geen vestiging heeft in de Europese Unie, waarbij gebruik wordt gemaakt van al dan niet geautomatiseerde middelen die zich in Nederland bevinden, tenzij deze middelen slechts worden gebruikt voor de doorvoer van persoonsgegevens. De Wbp geldt dus niet als het verwerkingen betreft door een verantwoordelijke, die geen vestiging heeft in Nederland, met gebruikmaking van middelen die zich niet in Nederland bevinden. Vraag 4: Bent u bereid om met Google in overleg te gaan om actie te ondernemen tegen deze website? Zoals eerder aangegeven hecht het kabinet aan een vrij en open internet. Het via Google onbereikbaar maken van zich op het internet bevindende gegevens verdient dan ook niet de voorkeur. Dit geldt des te meer omdat gegevens, waaronder persoonsgegevens, zich daarmee onverminderd op het internet bevinden. Tot slot geldt dat burgers waarvan ten onrechte persoonsgegevens op deze website zijn gepubliceerd, een individueel verwijderverzoek kunnen indienen bij de zoekmachines als zij die behoefte hebben, ten einde de resultaten te verwijderen na een zoekopdracht op hun naam. Op deze manier worden hun gegevens in ieder geval minder goed vindbaar. Vraag 5: Bent u zich ervan bewust dat in sommige kamerstukken gelinkt wordt naar de betreffende website? Bent u bereid ervoor te zorgen dat dit in de toekomst niet meer gebeurt? Ja, ik heb inderdaad naar aanleiding van de berichtgeving geconstateerd dat in diverse publicaties van of via de overheid verwezen wordt naar deze website. Wat mij betreft geniet het de voorkeur om te verwijzen naar de primaire bron en genieten daartoe de kanalen van de Rijksoverheid (zoals www.rijksoverheid.nl en www.officielebekendmakingen.nl) ten principale de voorkeur in het licht van vertrouwde communicatie met burgers. Dit onderwerp zal binnen de daarvoor passende gremia van de Rijksoverheid onder de aandacht komen. “Minister Grapperhaus van Justitie en Veiligheid heeft in een brief aan de Tweede Kamer laten weten dat de regering geen stappen zal ondernemen tegen de scrapingwebsite van een Rus, waarop 4,3 miljoen bestanden zouden staan, waaronder bestanden met persoonsgegevens. “[..] als minister kun je hier natuurlijk echt weinig aan doen, die taak ligt immers bij toezichthouders zoals de Autoriteit Persoonsgegevens of bij de mensen die getroffen zijn door deze publicatie. Hoe vervelend ook, het is een civiele kwestie – je moet zelf een rechtszaak aanspannen als je auteursrechten worden geschonden of je privacy te grabbel wordt gegooid. This entry was posted in advertising, analysis, copyright, cyber crime, Google, seo, tv. Bookmark the permalink.